Artists from around the world are challenged to present their visions of space in the future, resulting in a fantastical experience. Such film noir and dream-like experiences can be found at this current exhibit at MOT, which showcases the work of artists from around the world who strive to redefine the physical, spiritual and functional definitions of space. Walking through the show, visitors are treated to a variety of views on the future, ranging from scenes plucked from a Sci-Fi novel to ordinary product design that one can realistically expect to hit shelves the within the next year. 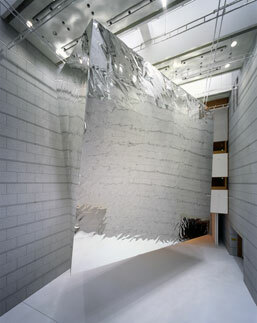 Probably the most prominent piece and best example of an artist’s Sci-Fi vision of the future was Junya Ishigami’s balloon, a gigantic three-story trapezoidal helium-filled aluminum balloon, weighted just right so it floats a couple of meters off the ground. The main viewing area for this piece in the basement, but it can be seen from balconies on all floors of the museum. Observing the visitors in the basement from the third floor was reminiscent of UFO watchers gawping in awe a spacecraft that finally lands and confirms their suspicions. Coupled with Ernesto Neto’s Philohumanoids bean bags, one might feel like they were on an episode of Star Trek. 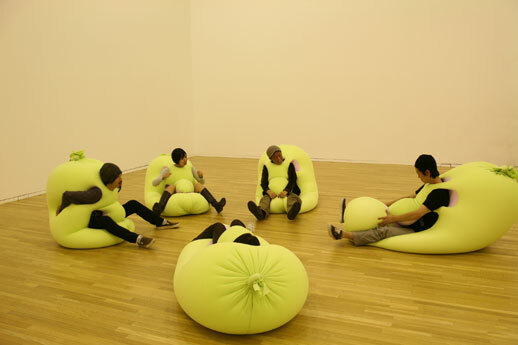 These wearable bean bags are open to the public to try on and be transformed into a neon green giant turtle. A bizarre sight, but surprisingly comfortable once you’re wearing them. If you prefer an uncomfortable mix gaudyness and bleakness in your image of the future, then you should check out AVAF’s (Assume Vivid Astro Focus) anatato vuivui attoteki fukusayo. This two-floor, run down shack is decorated with hanging colorful plastic ribbon decorations, wall paper of demon like creatures and flashing neon signs. Visitors are welcomed to enter and explore at their leisure. Other artists created works focused on our near future, more in the realm of prototype models. For example, DEMARKERSVAN’s Lace Fence turns an ordinary chain link fence into both a functional and aesthetically pleasing work of art by twisting the regular criss-cross of parallel lines of a fence into meandering floral patterns. 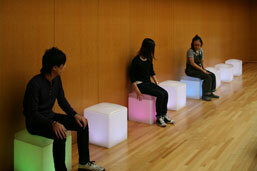 Mongoose Studio’s fuwapicaa future is a series of lighted plastic stools that change color when sat on. (The more you weigh, the deeper the change in color.) Seen from the outside, Kiichiro Adachi’s e.e.no.24 is a transparent phone booth with a disco ball and music blasting from the headphones. Inquisitive visitors who step inside will find themselves surrounded by two-way mirrors, ‘alone’ in an infinite world of reflection. A new strategy to bring the public phonebox back from the brink of death? Some pieces of the show fall short on addressing what the future may be like and focus more on our interaction with space, like Carsten Nicolai’s room-sized installation fades. 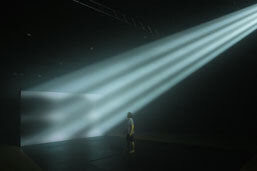 Entering through a dark corridor, visitors are at first forced to rely on their sense of touch and hearing alone to get to the center where they are entranced by smoke wafting across rays of light. 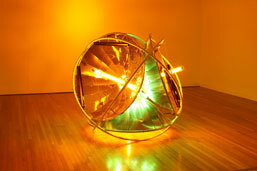 Olafur Eliasson’s Quadruple suncooker lamp alters viewers’ perception of color and light. The yellow light bouncing off the blue reflectors removed any bright tones from the room, resulting in a techni-color effect often seen in old movies. “Space for Your Future” offers an atypical art experience and consists of a broad enough range of work to appeal to a wide audience. Though sometimes requiring a stretch of the imagination, you’ll find yourself treated to some unconventional views of space, the future and our space in the future through a variety of practical and visually stunning art, architecture and design.